Our Outreach - Koehler Landscape Construction Services, Inc.
We recognize the social responsibility that we have to our neighbors and community. So we initiated a program that directly benefits New Hampshire residents affected by breast cancer. 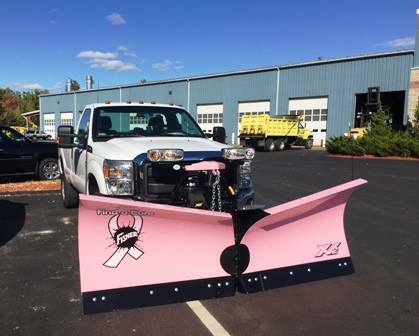 In 2013 we started by painting two of our snow plows pink to raise breast cancer awareness. In 2014 we pledged to donate 1% of our gross sales to New Hampshire Breast Cancer Coalition and continue the program to paint pieces of our equipment pink. We even initiated a program where our customers can get involved. We come by with one of our pink pieces of equipment and take a picture of the equipment and our customer. Our customer will then reciprocate by donating $25.00 to New Hampshire Breast Cancer Coalition. We are building a wall of photos for our website and Facebook page that will feature our contributors. The New Hampshire Breast Cancer Coalition was the obvious choice when it came to choosing a charity. Their Support Services Fund directly benefits New Hampshire residents affected by this horrible disease. Please click the pink link for more information: New Hampshire Breast Cancer Coalition. See the pictures below that show some of the things we've done to further breast cancer awareness and keep the memory of Ericha alive. On April 30, 1892, the first library building in the Town of Amherst was dedicated. Under the leadership of Rev. Josiah G. Davis, D.O., $2800 was raised by voluntary subscriptions for the construction project. The library still needs donations as that $2,800.00 has long since been spent. We support the library and benefit directly as our daughters love going to the library. My youngest daughter even aspires to be a writer. She is already working on her first chapter book about a girl named Freedom that was born into slavery. Do you want to super-charge your donation to the library? If one of our customers donates up to 1% of the value their service contract we will match that 1% donation. 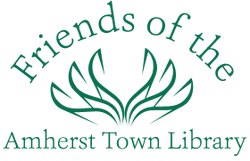 For example if your contract is for $1,000.00 and you choose donate an additional $10.00 (1%) we match that $10.00 donation to the Friends of the Amherst Library.